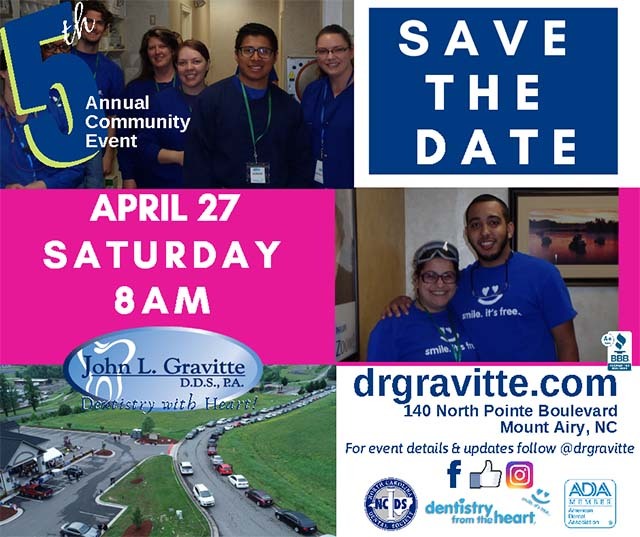 Dr. Gravitte and his team are hosting their 5th Annual 'Day of Free Dentistry' in partnership with Dentistry From The Heart on Saturday, April 27th, 2019! Our team loves to give back in the best way we know how - spreading smiles! In addition to giving back to our community through various sponsorships, donations, and educational outreach, we are thrilled to host our annual Dentistry from the Heart, an event that provides free dental care to those in need in our community. Every year, multiple doctors, hygienists, dental assistants, office staff, as well as various community sponsors, come together to contribute their time, resources and talent for this event. Since 2015, we have been able to provide hundreds of patients with free cleanings, extractions, fillings, X-Rays, and Oral Cancer Screenings!